Here's an archival treat for Escapade fans. The Ultima Thule folks (i.e., the Freeman brothers, Audion Magazine) have released not the newest Escapade album, but the bands first ever live performance from 9/19/96. 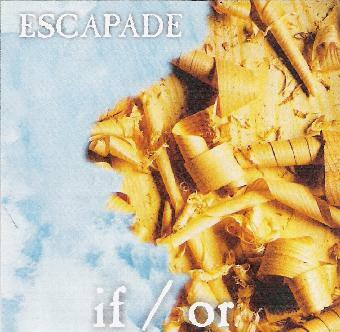 Escapade performed two evenings at SponCom '96, the second of which had been released years ago on Escapade's second album, Inner Translucence. The album consists of one 44 minute track, which makes sense because Escapade performances are fully improvised and typically run continuously. The music begins with a dreamy ambient drifting atmosphere. We get some killer cosmic synth swirls, and after about 6 minutes the drums and bass kick in to get the rhythmic groove going, and guitar joins in to add a slow jamming feel. The tension builds gradually into a completely spaced out rocking full band jam that will be like heaven to fans of acidic Krautrock. But this is by no means a retro act. Escapade bring together multiple influences, from classic Krautrock, Space Rock, Trance, Jazz and avant-garde elements, to create their trademark brand of psychedelic soundtrack. I've said in past reviews that despite being all improvised, Escapade's music comes across as having a composed feel. And while the freeform jamming quality is much in evidence here, the band manage to march down a determined, linear path that never seems to stumble or need to refer to its map for direction. Normally I would describe this type of release as being for veteran fans only and recommend newcomers start with something more recent. But this was such an impressively cosmic and satisfying 44 minute voyage that I say go for it and hop aboard. Better act quick though because this is a limited edition of only 75 copies. For more information you can visit the Escapade web site at: http://www.motherwest.com/escapade. Visit the Ultima Thule web site at: http://www.ultimathulerecords.com.